Acute attack of angle-closure glaucoma in both eyes can happen in selected conditions. Drug-induced angle closure glaucoma is one such. Others include snake bite reaction. It is a well-known fact that mechanism involving angle closure is “pupillary block.” However, “nonpupillary block” mechanisms do prevail as in intake of sulfa drugs. This case reports the sequelae of events following intake of cotrimoxazole. A 55-year-old female came to the emergency with acute onset diminution of vision in both eyes for a day. She had associated history of redness, pain, watering, and colored halos. She did not have any systemic comorbidities. Examination revealed best-corrected visual acuity of OD–finger counting at half meter, OS– finger counting at ¼ meter. Both eyes showed circumcorneal congestion and diffuse corneal edema. 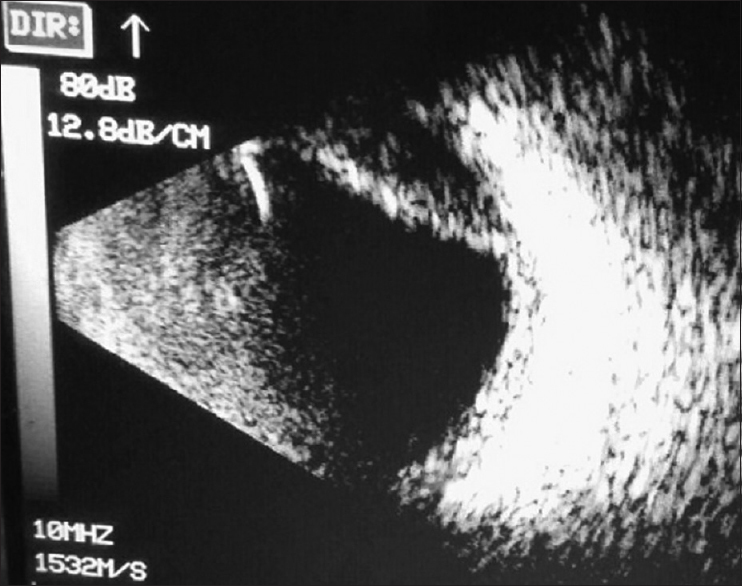 Anterior chamber was shallow with Van Herick–Grade 1 and lens-iris diaphragm pushed anteriorly. Pupil was vertically oval and dilated [OD-[Figure 1]a and [Figure 1]b, OS – [Figure 2]a and [Figure 2]b. Intraocular pressure by Goldman Applanation was OD-47 mmHg and OS-43 mmHg. Gonioscopy and Ophthalmoscopy were not possible due to the corneal edema. Having made a diagnosis of acute angle closure attack in both eyes, she was treated with intravenous mannitol, oral acetazolamide 250 mg QID and topically with 0.5% timolol eye drops BD and 2% pilocarpine eye drops QID. LASER iridotomy was attempted but could not be done due to poor constriction of pupils. On further probing, the patient revealed intake of two doses of 960 mg of oral cotrimoxazole for fever and cold with myalgia a day before the presentation after which, the B-scan done revealed shallow choroidal effusion inferotemporally in both eyes [Figure 3]. In light of the above findings, pilocarpine was discontinued and instead atropine 1% eye ointment was started. Corneal edema began to clear, and anterior chamber started to deepen. Visual acuity improved to 6/60 in OD and 4/60 in OS. Intraocular pressure recorded was 9 and 11, respectively. The revised diagnosis was “nonpupillary block” glaucoma. The presence of choroidal effusion further correlated with it, and so was treatment with topical steroids and cycloplegics. This was followed by deepening of anterior chamber, clearing of corneal edema, and reduction in intraocular pressure without any topical antiglaucoma medication. The case discloses to the practicing ophthalmologists, the entity of nonpupillary block angle closure glaucoma and its management with atropine which is usually a contraindication in angle closure attacks. Angle-closure glaucoma is most commonly caused by relative pupillary block mechanism. Angle-closure attacks may also occur in predisposed eyes following intake of drugs such as topiramate, hydrochlorothiazide, and sulfa drugs. Pilocarpine can induce acute angle closure glaucoma in its own right, as a result of forward displacement of the lens-iris diaphragm. Tricyclic antidepressants, for example, clomipramine, imipramine, amitriptyline, and selective serotonin reuptake inhibitors may precipitate angle closure. The underlying mechanism is pupillary block caused by pupil dilatation, which is attributed to the significant anticholinergic and serotonergic side effects of the antidepressants. Sulfa-based agents such as topiramate, acetazolamide, and hydrochlorothiazide are among the few drugs that can induce “nonpupillary block” acute angle closure glaucoma. There are three case reports on cotrimoxazole-induced angle closure glaucoma in literature search, however, no such reports from India. Hence, its mechanism and treatment modalities are described in this article. Quagliato et al. have reported that sulfa-based drugs can cause shallowing of the anterior chamber, choroidal effusion, increased intraocular pressure, swelling of the lens, and retinal edema. The typical presentation is blurred vision due to forward displacement of the lens-iris diaphragm (myopia). The exact mechanism by which sulfa-based agents cause acute angle closure glaucoma is unknown, attributed to idiosyncratic reactions to the drug per SE Ciliary body swelling and anterior choroidal effusion can both cause forward displacement of the iris-lens diaphragm resulting in obstruction to aqueous flow and subsequent acute angle closure glaucoma. It is interesting to note that the mechanism of forward push of lens-iris diaphragm holds good even for intraocular lenses. Both ciliary body swelling and anterior choroidal effusion can also reduce the diameter of the ciliary body ring, leading to zonular laxity that facilitates lens thickening and further decreases the anterior chamber depth. Since the mechanism is nonpupillary block, peripheral iridotomy may not relieve the attack of angle closure. Topical pilocarpine may increase the surface area of lens-iris touch and may worsen the formation of peripheral anterior synechiae. Paradoxically, cycloplegics are given to reduce the ciliary edema and topical steroids to reduce the choroidal effusion. Both are found to be responsive as reported in this case. Spadoni et al. reported a case of acute angle closure following intake of trimethoprim with sulfamethoxozole prescribed for Pneumocystis carinii prophylaxis. Although it was diagnosed and the drug intake was stopped within 4 days, the patient had an unfavorable outcome and landed up with cataract and phthisis bulbi 2 months later. In contrast, our patient stopped the drug after two doses, had a favorable outcome, vision improved, and intraocular pressure dropped to normal, with deepening of anterior chamber. At 1 month follow-up [OD-[Figure 4]a and [Figure 4]b, OS – [Figure 5]a and [Figure 5]b, right eye had a vision of 6/9 with no anterior chamber reaction, clear media and 0.2 as the cup disc ratio. Whereas vision in the left eye did not improve beyond 3/60 with presence of sequelae of uveitis like posterior synechiae and fibrin in the pupillary plane. Disc hazily showed 0.2 cup to disc ratio. Rest of fundus appeared normal. Cotrimoxazole, being a commonly prescribed antibiotic in India, physicians, pediatricians, and especially general practitioners need to be aware of this uncommon idiosyncratic reaction. It is insisted on the ophthalmologists that in a case of bilateral angle closure attack, history of recent drug intake gives a major clue in the diagnosis and treatment since it involves stoppage of the offending drug. Iridotomy may not be effective for drug-induced nonpupillary block angle closure attacks. Rather, atropine and topical steroids have a proven benefit. Ah-Kee EY, Egong E, Shafi A, Lim LT, Yim JL. A review of drug-induced acute angle closure glaucoma for non-ophthalmologists. Qatar Med J 2015;2015:6. Brooks AM, West RH, Gillies WE. The risk of precipitating acute angle-closure glaucoma with the clinical use of mydriatic agents. Med J Aust 1986; 145:34-6. Lachkar Y, Bouassida W. Drug-induced acute angle closure glaucoma. Curr Opin Ophthalmol 2007;18:129-33. Quagliato LB, Barella K, Abreu Neto JM, Quagliato EM. Topiramate-associated acute, bilateral, angle-closure glaucoma: Case report. Arq Bras Oftalmol 2013;76:48-9. Razeghinejad MR, Pro MJ, Katz LJ. Non-steroidal drug-induced glaucoma. Eye (Lond) 2011;25:971-80. Panday VA, Rhee DJ. Review of sulfonamide-induced acute myopia and acute bilateral angle-closure glaucoma. Compr Ophthalmol Update 2007;8:271-6. Spadoni VS, Pizzol MM, Muniz CH, Melamed J, Fortes Filho JB. Bilateral angle-closure glaucoma induced by trimetoprim and sulfamethoxazole combination: Case report. Arq Bras Oftalmol 2007;70:517-20.